Literally no one is looking at you, Pharrell. An incredible video of a seven-year-old out-dancing Pharrell at his Leeds concert this week is going viral and it's not hard to see why. 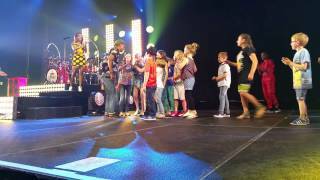 During his one-off show, Skateboard P kindly asked a ton of kids to join him on stage as he performed his hit single 'Happy' to the crowd, one of them being 7-year-old Dylan who totally stole the show as he confidently performed some Michael Jackson inspired moves centre stage and soon had all eyes on him - even Pharrell's. While Dylan's dad captures the entire thing on camera (and can be heard cheering his boy on in the background), Dylan - wearing a red t-shirt and black hat, completely owns his 15 minutes of fame. Watch the amazing video above.